A gun rights bull dog is coming back to Jefferson City! In 2016, when the Missouri Firearms Coalition was about to launch our fight to pass Constitutional Carry and Stand-Your-Ground law, we entrusted the bill to then-Rep. Eric Burlison — hoping he would deliver. And boy did he ever! Burlison’s resolve on the inside — combined with the unstoppable grassroots activism from MOFC members on the outside –- made Missouri the 12th Constitutional Carry state and the 34th Stand-Your-Ground law state! For the last two years, however, Burlison has been out of office after having served the maximum amount of time he could in the House. And, as we all know, the battle for our gun rights has suffered as a result, especially in the Senate which lacks Second Amendment leaders. And that’s why I’m so happy to report that Eric Burlison clinched an election victory in Senate District 20 Tuesday night — meaning he is coming back to the legislature! Of course, thanks to members like you, the Missouri Firearms Coalition has been doing all we can to educate gun owners in this district for some time. Using mail, email, social media and more we’ve exposed Jim Billedo’s support for radical gun control, while at the same time, informed them about Eric Burlison’s history of fighting for the Second Amendment! Clearly, gun owners in Springfield were not happy with Billedo’s radical gun control agenda. So thank you, to our supporters, for giving us the resources we need to fight for you! The fight for the Second Amendment is about to get white hot in Jeff City. The good news is that we have fierce legislative leaders in both chambers now — with Burlison coming to the Senate and with Rep. Jered Taylor’s reelection in the House which happened earlier this evening –- ready to help us get rid of ‘Gun Free Zones’ once and for all! The bad news is that lawmakers in both parties want to ram ‘Red Flag Gun Seizures’ into law, and more than a few are openly talking about raising the age limit on buying firearms. So take a moment and celebrate this victory, but realize that the 2019 session will be a wild ride. P.S. 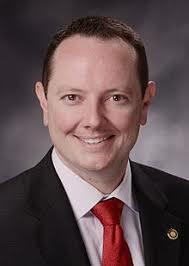 Gun rights champion Eric Burlison, who lead the charge to make Missouri a Constitutional Carry and Stand-Your-Ground won election to the State Senate! Thank you to the members of MOFC who helped us expose Jim Billedo’s radical gun control agenda in Senate District 20 using mail, email, social media and more! The fight for gun rights in Jeff City is going to get white hot next session; join the Missouri Firearms Coalition now!